Have you heard about Dursley’s Secret Garden? Tucked behind the Chantry Centre on Long Street in Dursley is a beautiful walled space that is being turned into a community garden thanks to ‘Transition Cam and Dursley’ and a number of partner organisations- including World Jungle! Come along to the Secret Garden Open Morning – FREE COFFEE & CAKE ALERT!! See the garden for yourself on Saturday 7th June (9am until 1pm), and tell us how you think the space could look and the kind of things it could be used for. There’s free coffee and cake for every idea shared! Could you volunteer some time in the garden – and help create a wonderful space for the whole community to use? Join the regular volunteering sessions on Wednesday mornings between 9am and 12 noon (starting next Wednesday 28 May). Each week a different garden project will be tackled, ranging from weeding and planting to building and installing. Come along to share your skills and knowledge, or to learn new skills with a fun group of hands-on, practical people. The garden is being managed according to permaculture principles, with the aim being to transform this hidden and unkempt haven into a thriving community garden with sustainability at its core. If you’d like to learn more about permaculture, why not join our Sunday afternoon Introductory Workshop at the Chantry Centre on Sunday 8th June 1-4pm. Cost just £4. The session will be lead by Ben Ward from World Jungle and Laura Irvine from ‘Transition Cam & Dursley’. See the World Jungle ‘what’s on’ section at www.worldjungle.org.uk for details. Our new project launches this weekend! “All in one Rhythm’ – our exciting new project sets to launch THIS WEEKEND! It encompasses a whole package of events and activities ranging from music and dance taster sessions, community fun days and a celebratory Carnival Party. All will be held at The Chantry Centre in the centre of Dursley, Gloucestershire. What pulls the programme together is the flavour of Brazil – bringing the full colour and energy of Brazil and its wonderful carnival traditions to rural Gloucestershire – at the same time as the world comes under the spell of football’s FIFA World Cup. The project is with thanks to funding from the BIG Lottery’s ‘Awards for All’ programme. We want to use the World Cup in Brazil this summer as a springboard to inspire people through ‘sharing some of the best of our world…’ Bringing people together, making the World Cup an exciting family event – even for those who don’t like football! 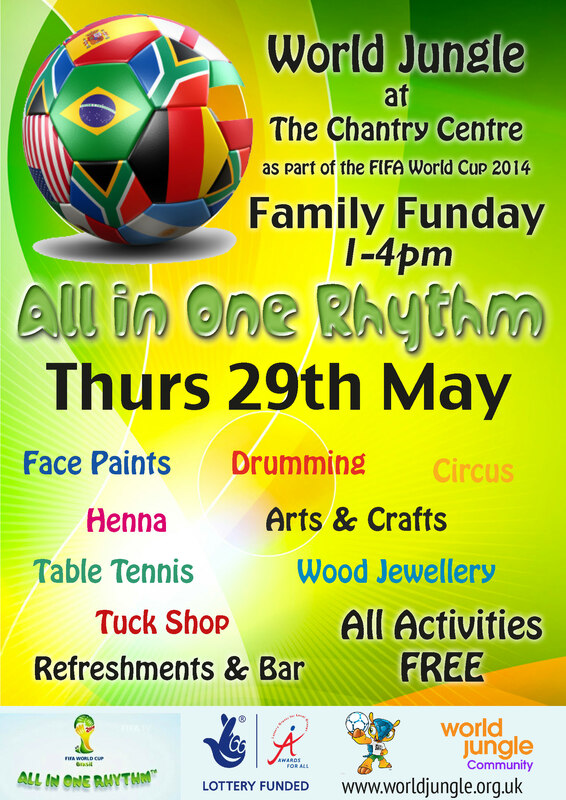 THE FOLLOWING WEEK – Thursday 29 May from 1pm-4pm FREE Community Fun Day, with lots of activities for the whole family to enjoy – and including a FREE Samba taster workshop from 2-3pm with the Bath School of Samba. We hope that you will be able to join us at all or some of these events – and please do spread the word to others who may be interested in attending too! Looking for an excuse to get dressed up and enjoy a fabulous night out with music, dance, DJ and Casino Table? Get along to the Chantry Centre, Lister Hall in Long Street, Dursley on Saturday 31st May for World Jungle’s ‘Gangsters and Molls’ themed party night. 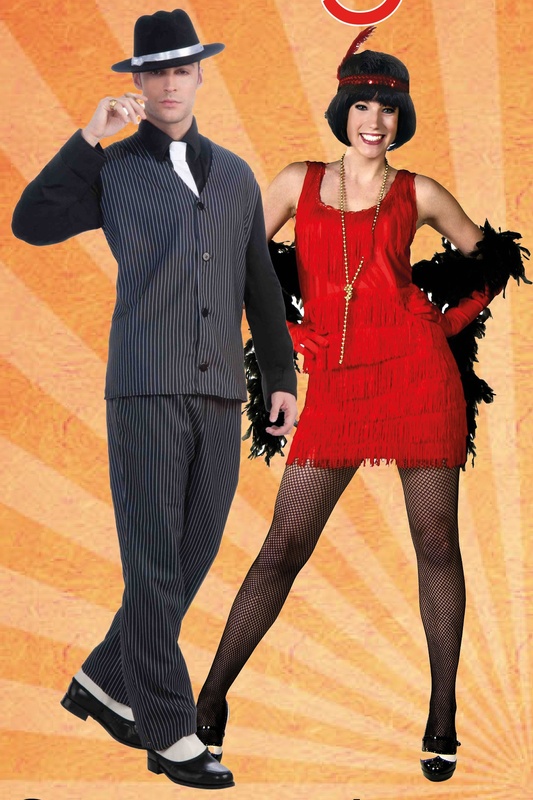 The event promises to be a great evening of entertainment mixing up live stage acts and interactive dances, a casino table, and disco till late playing a great mix of music including electroswing, pop and disco. “This is going to be lots of fun! There will be some great live acts performing including local dance troupe Jungalicious performing a fabulous Charleston number with World Jungle’s very own Ben Ward! 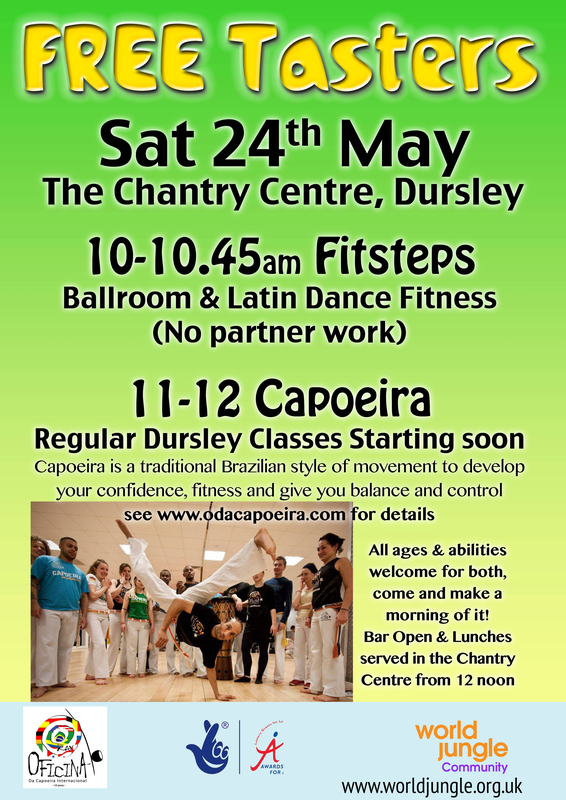 On Saturday 24th May, the Chantry Centre in Dursley will be bouncing to the ‘Beat of Brazil’ with a morning of FREE workshops inspired by the theme of Brazil and this summer’s World Cup. From 10am-10.45am you are invited to try ‘FITSTEPS’, a new fitness craze sweeping the country, blending the elegant movements of Ballroom and the up-tempo pace of Latin dances in an exciting and fun fitness programme. At 11.00am-12noon the stage is given to CAPOEIRA (lead by Oficina Da Capoeira), a traditional Brazilian style of movement which promises to improve fitness, confidence, balance and control. “With thanks to funding from the BIG Lottery’s ‘Awards for All programme’, we want to use the FIFA World Cup in Brazil this June and July as a springboard to developing a healthier, happier, more active community, creating a wave of positive community action. A further free taster session in SAMBA DRUMMING is organised for 2-3pm on Thursday 29 May at the Chantry Centre, with the renowned Bath School of Samba, Jamma de Samba. This will form part of a community fun day at the centre that afternoon from 1pm, with lots of activities fun activities for the whole family to enjoy including arts & crafts, face painting, table tennis, drumming and circus fun. Please visit http://www.worldjungle.org.uk to find out more. The Chantry Centre in Dursley will be bouncing to the ‘Beat of Brazil’ this summer, with thanks to a new project lead by World Jungle. “Our ‘All in One Rhythm’ project will help make this World Cup an exciting family event – even for those who don’t like football! We want to use the FIFA World Cup in Brazil this June and July as a springboard to developing a healthier, happier, more active community, creating a wave of positive community action. The project is with thanks to funding from the BIG Lottery’s ‘Awards for All’ programme. On offer will be Community Family Fun Days, a selection of regular music and dance classes, and a wonderful carnival party and BBQ bringing the full colour and energy of Brazil right here to rural Gloucestershire. All the events will take place at The Chantry Centre (Lister Hall) in Long Street, Dursley. Thursday 29th May – 1pm-4pm FAMILY FUN DAY to launch and promote the project. Tuesday 24th June (5pm-8pm) – Watch ‘England V Costa Rica on the big screen at the Chantry Centre. Plus lots of fun activities for the whole family to enjoy. Look out too for FREE TASTER SESSIONS in Capoiera, Samba Drumming and Fitsteps!